Nowadays people seek their own piece of heaven where they will experience maximum of comfort and relaxation after a busy day. 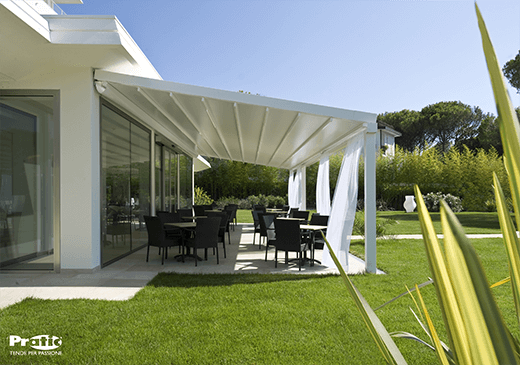 In order to meet those expectations at Shades Awning & Canopies we offer you the ideal outdoor space arrangement solutions for your home and company. We believe that in our wide range of pergolas you will be able to find something that suit both your tastes and budget. All our products are made of high quality materials and they are available in many different colours, sizes and designs so that everyone will find something for himself. 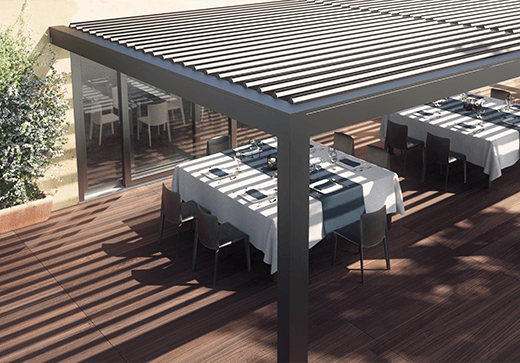 We have both – pergolas with wooden structures, for people who appreciate the contact with nature, and an aluminium ones designed for those who prefer the perfectly balanced fusion between modernity and functionality. Our pergolas have been provided with a wide range of amenities such as adjustable sunscreen blades, additional Raso perimeter closures or covers which are motorised in order to create even more comfortable environment for you and your family. We hope that thanks to our products, regardless of weather conditions, you will be able to fully enjoy your new, comfortable and relaxing outdoor space. We are pleased to present you a pergola LEVEL which is the embodiment of refined beauty and exceptional durability. It has been designed while having in mind the comfort and the pleasure of being outdoors. Thanks to its elegant and simple shape it will ideally prove itself both in seaside coffee shops as well as in your private garden. It will significantly enlarge the living area and will protect you from the harsh sun and rain. Our Tecnic Series pergola has been tested in the Pininfarina wind tunnel with simulated turbulence and a wind speed of 90km/h. It is made of the highest quality materials in order to preserve its functional and visual properties for many years. We are confident that our products will fit even the most demanding tastes and individual needs of our costumers. Provided with shading, waterproof, highly stable PVC cover. If you are looking for a little bit of luxury for your family or customers then our OPERA is something perfect for you. This pergola, created out of pure elegance and polished design closed in wholly aluminum-made frame, will ideally prove itself both in the open area as an independent construction as well as a shading for your patio. It has adjustable sunscreen blades with rotation up to 140° and intermediate modular positions thanks to which it can be easily adapted to changing weather conditions and your individual needs. For even better protection it can be completed with additional Raso perimeter closures. It will be ideal solution for private gardens, restaurants and cafés. For centuries people appreciate close contact with nature. Therefore, we present you pergola WOOD which has been designed specifically for people who seek relaxation in harmony with nature. We believe that it represents the perfect combination of durability and natural beauty. The structure is made of laminated Nordic pine wood and it is provided with shading, waterproof and highly stable PVC cover which is operated with a motor. Such solution provides you with additional comfort and ease of use. Pergola Wood is ideally suited to private gardens as well as cafés where it creates a pleasant, warm and welcoming atmosphere. Tecnic cover with packaging operated with a motor. Among many products that can be found in our assortment pergola BIG undoubtedly stands out the most. It is a large, self-supporting pergola created while having in mind the protection of wide spaces. Its aluminium frame with stainless steel components guarantees durability and good looks for many years. Despite its size, it is the structure full of grace and it does not overwhelm its surroundings. It can be used for reducing sunshine for beer gardens as well as protecting large family events. The owners of cafés and bars will appreciate the unquestionable advantages of this design. Self-supporting aluminum frame with stainless steel parts. Patio Pergola &dash; due to their bigger size, sturdier frame, and better resistance to wind, our pergolas would be a practical and stylistic addition to your patio. From now on, you and your family will be able to enjoy your patio and garden without any fear of the weather. House Pergola &dash; whether it is your garden or veranda, our highly customisable pergolas will cater to your needs. Thanks to our house pergola, you can spend a relaxing evening on your veranda and a pleasant summer afternoon in your garden away from the blistering summer heat. Commercial Pergola &dash; from the practicality of our Pergola Big to the style of our Pergola Opera, you can be sure that our pergolas won’t just be very practical and provide extra seating for your customers, but will also be highly customised, special and make your business stand out and be memorable. Why should I choose a pergola? What are the available sizes of your pergolas? Can I set the motor to close my pergola? Yes How long will it last?